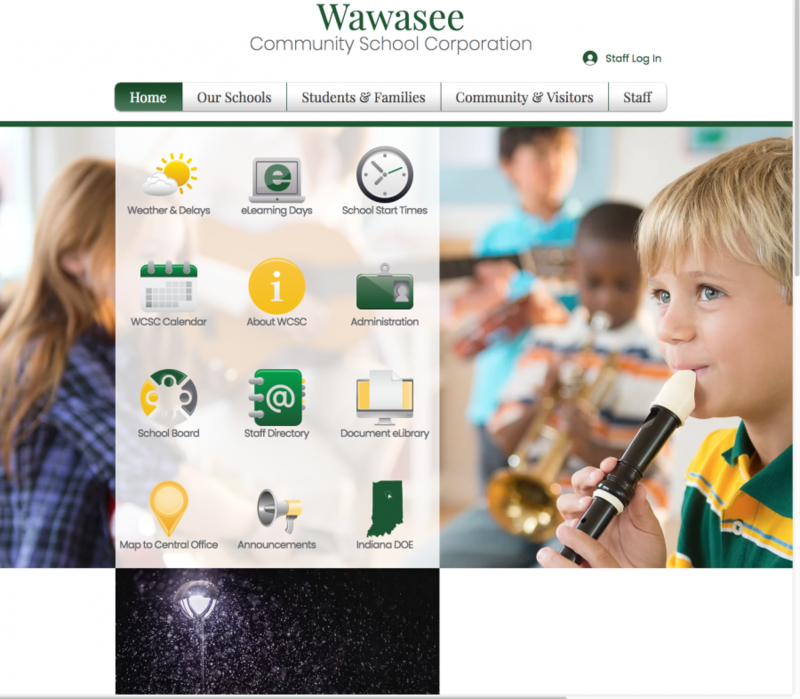 Shown is the home page for the new Wawasee website. SYRACUSE — Because students can attend a school outside of the district they live in, marketing for school corporations has taken on added significance. “School corporations are competing for the same kids,” said Dave VanLue, technology director for the Wawasee Community School Corporation. With increased marketing as a point of emphasis, a revamped website was officially launched for the school corporation Tuesday, March 19. It is designed to be more user friendly, easier to navigate and mobile friendly. “We were cramming a lot of information on every page and it just became overpowering,” VanLue said, commenting about the previous website. Angie Taylor, the staff health coach who was involved in the design of the new site, said the previous site “was sort of like a bulletin board.” Some announcements were current, but others were outdated. Previously each school in the corporation built their own web pages but now it will be managed by Taylor, who said “we want to use it as a resource.” All school announcements are on one page now. VanLue noted the new site should be more pleasing to the eye and will be based on who the user is, whether a student, a parent or someone who is simply interested in finding our more about the school corporation. The intent is for whoever is visiting the website to be able to click on a button on the home page to go to the page to get the information they need. Icons are bigger, words are fewer, there will be a social media stream all fed into one page on the site and there will be more photos and stories. Marketing will be emphasized more as it has at other school corporations. Goshen Community Schools, for an example, has been promoting itself through TV ads and billboards. Students, staff and alumni will be interviewed and some will be videotaped, which will be posted on the website. VanLue commented he was at a seminar recently and a superintendent of a school corporation in Wisconsin talked about the importance of schools telling their stories. A marketing team was put together at the start of the school year to talk about revamping the website. It could have been launched sooner, but several weather cancellations of school delayed it. Using the website to communicate eLearning information took on more of a priority. The URL for the revamped website remains the same at www.wawasee.k12.in.us. VanLue noted the revamped site will be monitored to see how many visits and clicks it receives.